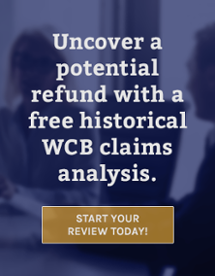 Our Historical Cost Recovery Review provides an in-depth analysis of your WCB claims history. The claims costs that appear on your annual experience rate statements, are used to establish your WCB premium rate. As such, any reduction in claims costs can have a positive impact on your WCB premium rate. BCL reviews your claims and ensures that no unnecessary costs are being assessed against your account, and that any opportunities for cost recovery are not overlooked. Even if no recoveries are realized, our review will ensure that the claim’s costs are justified. Our review covers all aspects of a claim such as the initial entitlement decision, compensation rate setting, ongoing entitlement to benefits, medical reporting, identification of pre-existing or concurrent conditions, permanent impairment assessments and any appeal action or decision on a claim. Upon completion of the review, we will identify areas of potential cost recovery, initiate action and pursue issues to their ultimate resolution, including representation at all levels of WCB review or appeal. As part of the Historical Cost Recovery Review, BCL will also review your industry classification and the rate applied to your organization. It is the employer’s overall operations that determine the industry classification, however there is a wide variance in industry classification descriptions and the rates attached to them. As such, this can make classification errors very costly. We will periodically review your company’s operations to ensure that you are always properly classified and ensuring that you are paying the lowest rate possible. The Historical Cost Recovery Review is completed on a contingency fee basis, so there are no upfront costs to participate. When an Agreement has been signed, we will request a copy of the claim files identified for review from the applicable WCB. Once the claims are received, they will be reviewed, issues of cost relief or cost removal will be identified and any action, if indicated, will be initiated. If there is no further action indicated on a claim, there is absolutely no cost for the review. If further action is identified and pursued, but cost recovery is not realized, there is still no cost for the review. It is only once we are successful in reducing the cost of a claim – which translates into a lower Premium rate – will there be a fee for this service. The bottom line is if we don’t save you anything, it won’t cost you anything!